Diagnostic kits to help teachers and players find their best fit! (Or- If you would like to be fitted with a chinrest, click here). Components of these kits determine the correct contour and height of a chinrest for each individual, and make placing and removing the parts of the kit easy. All of the kits are to be used for diagnosis only and are not meant to be played on for long-term practicing or performing. The kits' components allow you to determine which chinrest height and shape fits best. Then, on that basis, a chinrest order is placed. Gary Frisch hand crafts all of the lifted chinrests and shims according to your order. 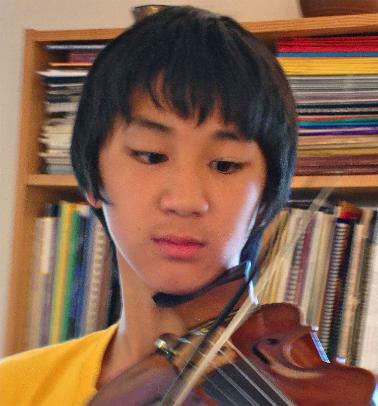 longer-necked players find chinrests that their fit neck height and jaw shape. half centered over the tailpiece (right photo). The Frisch and Denig Chinrest Fitting Kit, "Fortissimo"
The fitting kit, "Fortissimo", is best used for players whose necks are about 85 mm or taller who play full-size violins and equivalent or larger violas. 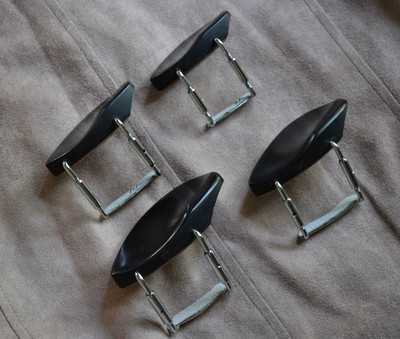 The kit offers a series of "lifts" to help find the best height of chinrest, and also "toppers" to help the player find a chinrest that fits the shape of the jaw. For hints on how to use Fortissimo Fitting Kit, please see Directions for the "Fortissimo" Fitting Kit. 1. “Lifts” from 10 to 25 mm designed to custom fit chinrests according to player neck height and the preference for left or slighty centered placement over the tailpiece. 3. Shims ranging in height from 1-4 mm. Combinations of no more than two shims can be used to fine tune lift height. Shims should not be used for long-term playing or practicing. 4. Viola barrels to make the kit adaptable to fit violas of varying rib widths. 5. A chinrest key to install or remove chinrests and chinrest lifts. 6. A tape measure (shape varies according to availability) used to measure the neck. 7. 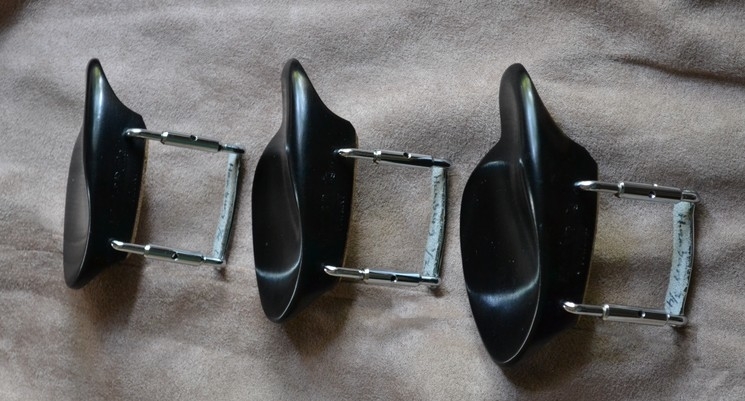 A sponge (models vary) that fits over the chinrest hardware on the bottom of the instrument to provide side-to-side stability of the instrument and for protection of the collarbone from the chinrest hardware. The sponge also provides gentle friction for confident balance of the instrument close to the neck. 8. Rubber bands to hold the sponge in place. 9. A kit to hold all of the above (design and colors vary depending on availability). Components of the the Frisch and Denig " Fortissimo" Fitting Kit. (Case models and colors vary). The Frisch and Denig Chinrest Fitting Kit, "Crescendo"
The fitting kit, "Crescendo", is best suited for players of full-size violins and equivalent or larger violas. The neck height of such players will be 85 mm or less. Crescendo components include assembled, non-lifted chinrests and shims to adjust height up 9 mm. For hints on how to use Crescendo see Directions for the "Crescendo" Fitting Kit (coming soon). 2. Shims ranging in height from 1-5 mm. 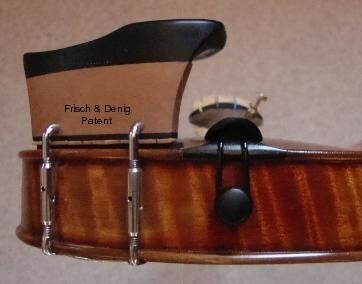 Combinations of no more than two shims can be used to fine tune chinrest height. Shims should not be used for long-term playing or practicing. 3. Viola barrels to make the kit adaptable to fit violas of varying rib widths and to accommodate taller shim heights for violin. 4. A chinrest key to install or remove chinrests. 5. A tape measure (shape varies according to availability) used to measure the neck. 6. A sponge (models vary) that fits over the chinrest hardware on the bottom of the instrument for lateral stabilization of the instrument and for protection of the collarbone from the chinrest hardware. 7. Rubber bands to hold the sponge in place. 8. A kit to hold all of the above (design and colors vary depending on availability). 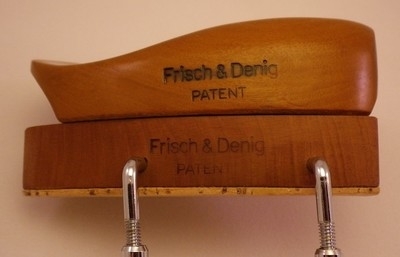 The Frisch and Denig Chinrest Fitting Kit, "Piccolino"
The fitting kit, "Piccolino", is Frisch and Denig's chinrest fitting kit for fractional-size violins and violas. For hints on how to use Piccolino, see Directions for the "Piccolino" Fitting Kit (coming soon). 1. 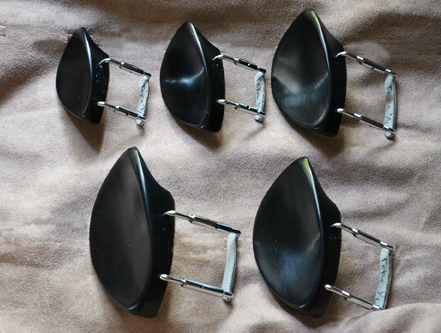 Non-lifted, fractional-sized chinrests in the following models: Brandt (1/8, 1/4, 1/2, 3/4), Hamburg (1/4, 1/2, 3/4), and Teka (1/16, 1/8, 1/4, 1/2, 3/4). (See Our Chinrest Line for photos and descriptions of each). 3. Shims ranging in height from 1-5 mm (see Crescendo accessories, above). Use combinations of no more than two shims to fine tune chinrest height. 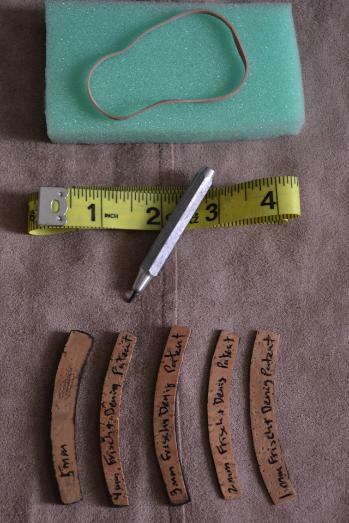 Shims are not intended for long-term playing or practicing. 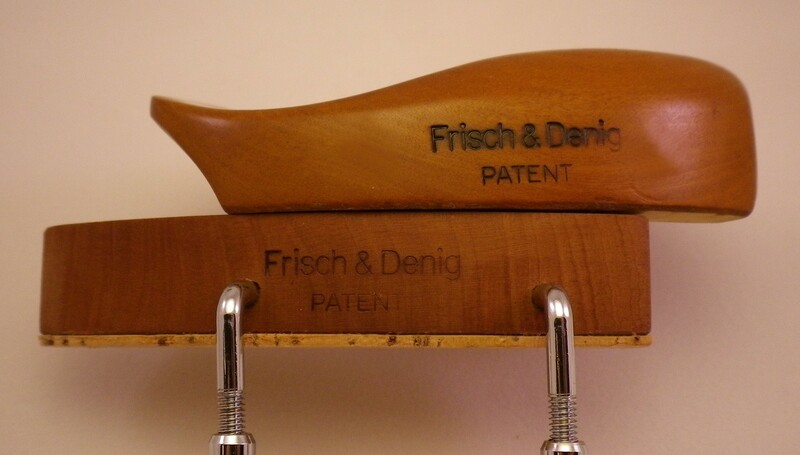 Brandt chinrest, left, crafted by Gary Frisch. If you would like training in the fitting process, please Contact Us.